Swimming in ponds and streams was common in the early 1900s. Swimming pools started to gain popularity after swimming was featured in the first modern Olympic Games in 1896. Many of the first pools, however, were private or belonged to country clubs, and only the elite had access to them. 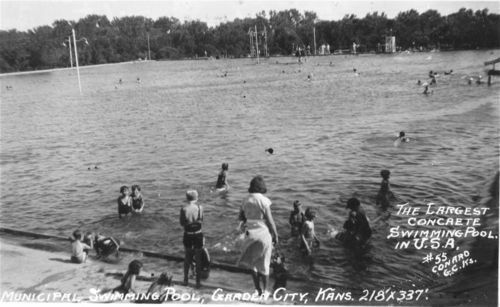 By the 1920s some larger communities in Kansas had public pools, but smaller towns had no means to build them. This changed in the 1930s with the emergence of the Works Progress Administration, a New Deal program. The WPA was created in 1935 with $1.4 billion in federal funds. It was intended to give large numbers of people employment with locally sponsored projects. Engineering, road construction, and public building projects such as outdoor recreational facilities were all WPA sponsored. In 1936 the WPA employed more than $3 million people. Between July 1935 and June 1939 the WPA improved or constructed 40 Kansas pools. These pools were usually located in public parks and were close to other recreational facilities. While these pools became a great public resource, not all members of the public could use them. Many public places, including swimming pools, were segregated, especially in larger cities. African American poet Langston Hughes spent much of his childhood in Lawrence. He wrote about segregated swimming pools in his autobiography. “Misery is when you find out your bosom buddy can go in the swimming pool but you can’t,” he wrote. A private swim club in Lawrence, the Jayhawk Plunge, was an example of a segregated pool. In a brochure advertising summer activities, the Plunge invited Lawrence residents to swim in a “socially selective and friendly” pool. The registration form included room for the applicant’s name, address, age, and race. Although an antislavery stronghold during territorial days, Lawrence had segregated swimming pools until the 1960s. Civil rights organizations tried to integrate private swim clubs that denied admission to African Americans but were unsuccessful. Lawrence voters agreed to fund a municipal swimming pool in 1967 and two years later that pool was opened.